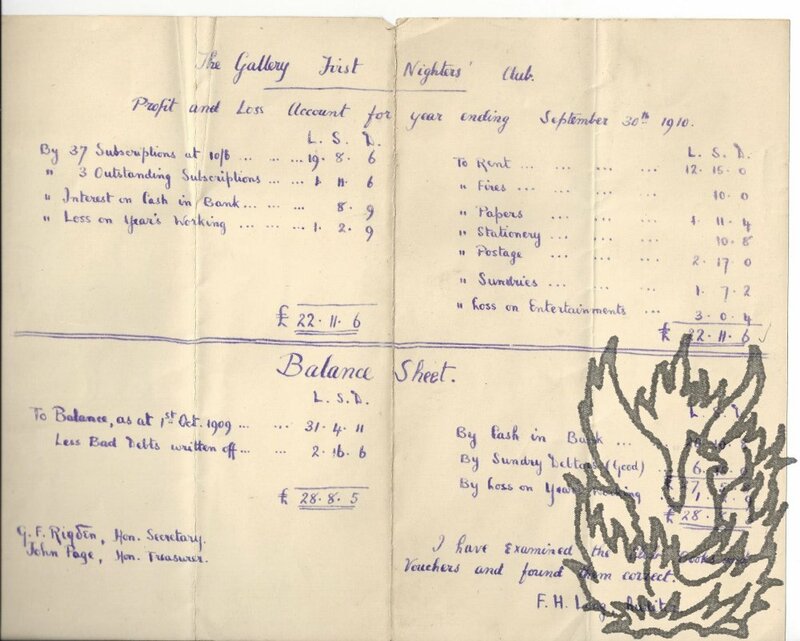 [ The Gallery First Nighters' Club, London. ] 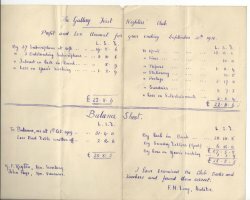 Duplicated accounts and balance sheet by 'F. H. Long, Auditor'. 1p., landscape 12mo. Spirit duplicated with purple ink. In fair condition, lightly aged and worn, and folded three times. The page is headed 'The Gallery First Nighters' Club', and is divided into two section: 'Profit and Loss Account for year ending September 30th. 1910.' and 'Balance Sheet'. At foot of page: 'G. F. Rigden, Hon. Secretary. | John Page, Hon. Treasurer. | I have examined the Club Books and Vouchers and found them correct. | F. H. Long, Auditor.' From the papers of Ken Sephton (Sefton).